Cerebral palsy is a disorder that affects body movement and muscle coordination. 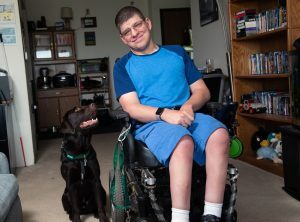 But Levi Dokken hasn’t let cerebral palsy slow him down. A full-time employee, Levi’s average day consists of a mile walk to and from the train station, a 45-minute train ride, and then working the sales floor at Best Buy. He walks, on average, six to seven miles a day. In fact, after Levi was matched with Mobility Assist Dog Dempsey, he purchased a FitBark, a device that tracks a dog’s steps, to see just how far the two ventured each day. Dempsey loves the exercise, and Levi appreciates how Dempsey helps him throughout the day. “He’s my right hand man,” he says. Rewind back to before Dempsey came along. Levi has trouble bending over. “With this chair, it’s got an elevator so that puts me up a few inches higher than I would normally be, which makes picking up things off the floor difficult, especially if they’re thin things like debit cards,” he explains. If Levi dropped something in public, he had to rely on a stranger to help him. Unfortunately, this could be a risky decision. “Sometimes you gotta do what you gotta do, and you cross your fingers and hope they don’t run off with your phone,” he explains. But Levi isn’t the only one happy to have Dempsey around. “Everyone at [Best Buy] is super excited and has seen the benefit that we bring to each other,” Levi says. Dempsey even has his own ID badge. “My co-workers wanted to get him a blue shirt like I wear. I kind of had to put my foot down and compromise with a name tag.” he smiles. “Occasionally it comes flying off if he shakes. But for the most part it stays put,” he laughs.